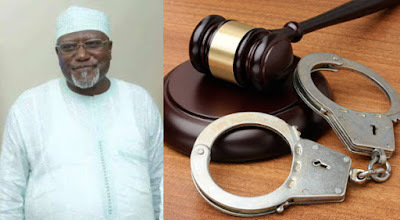 Former DSS DG, Lawal Daura has been arrested by the police minutes after Vice President Yemi Osinbajo announced his sack. Lawal Daura was sacked in the wake of a siege by security operatives on the National Assembly complex early Tuesday, ahead of a planned reconvening of lawmakers by noon. While the leadership of the All Progressives Congress (APC) dissociated itself from the siege, members of the Senate and House of Representatives have condemned the siege as a “coup against democracy”. Villa sources alleged that minutes after his sack was announced, the DG of DSS, Lawal Daura was arrested. Daily Trust gathered that the DSS DG was ferried away via three Police vans including two Toyota Hilux vehicles and a jeep. While the State House reporters were awaiting his exit from the office of the Vice President, Daura was taken away via the backdoor. “AgP Yemi Osinbajo has directed the termination of the appointment of the DG of the DSS, Mr. Lawal Musa Daura. He was at one time the Deputy Director Presidential Communication, Command and Control Centre at the Presidential Villa Abuja between 2003 and 2007. He also served as the State Director of Security Service at various times in Kano, Sokoto, Edo, Lagos, Osun and Imo States. He was appointed as the Director-General of the Department of State Service (DSS), following Ita Ekpeyong’s dismissal from the agency on July 2, 2015 by Muhammadu Buhari, the President of Nigeria.